Tom Baker is the Doctor in Robot. Regeneration is a tricky business. You never know what you’re going to get. When Jon Pertwee announced he was leaving the show in 1974, he was stepping away at the height of his popularity, but worried over a change in the production staff, a concern about being typecast and unable to gain future employment, and a sadness over the death of his close colleague Roger Delgado. Producers looked high and low for the actor who would portray the fourth incarnation of the Doctor, before finally settling on someone who was the complete opposite of the smooth, suave, collected Time Lord portrayed by Pertwee. When the first episode of his debut serial premiered in December of 1974, the BBC held their breath. Would the new Doctor appeal to fans of the show and keep them interested after the incumbent’s departure? There was no need to worry, as it turned out, as for over 35 years whenever asked to conjure an image of “Doctor Who,” the man who came to mind was a grinning madman with a broad hat and a long scarf. 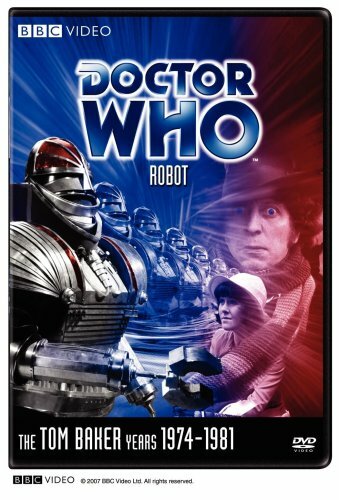 Robot is the introduction episode for Tom Baker as the Fourth Doctor. While in many ways a Third Doctor episode, Baker immediately puts his imprint on the role. A long-running companion stays, a new companion is introduced, old friends are seen one final time, and there’s a shadowy group hoping to take over the world with the unwitting assistance of a high-tech robot. If one can get past the dodgy special effects, Robot is a solid serial that hits all the right notes. There’s a strange man lying in the infirmary, someone who the Brigadier and Sarah Jane know very well, wearing a new face and a new body. And right now, they could use his help. Vital secrets are being stolen from government and military installations. UNIT and the Ministry of Defence are powerless to stop it. Who could be behind these thefts? Could it be members of the Scientific Reform Society who are trying to being about a society where they rule as the elites? Could it be Professor Kettlewell, who insists he’s only working on the means to harness solar energy? Or could it be something else, a technological marvel who is acting in what it believes are the best interests of humanity perhaps? Robot‘s production accompanied several high-profile departures. Long-time producer Barry Letts and Script Editor Terrance Dicks were leaving, with Philip Hinchcliffe as producer and Robert Holmes stepping in to takes Dicks’ place. Dicks’ last turn as script editor borrowed heavily from King Kong with the title K1 Robot becoming infatuated with Sarah Jane as a mother figure as the military tries to stop its rampage. The script itself could have come from the Third Doctor era as UNIT is heavily involved with a good bit of cloak-and-dagger as well, with some of the fourth episode’s tension revolving around a potential nuclear war if UNIT fails to assault a military bunker. Before Rose Tyler and Amy Pond, there was Sarah Jane Smith. While there were moments throughout her time on the show where she was the “shrieking companion,” Elizabeth Sladen’s performance here shows her as two things – the journalist looking for the story, and someone who misses the Third Doctor. She really never clicks with the Fourth Doctor until the end of the story, instead trying to find out the truth behind Professor Kettlewell, the K1 Robot, and the SRS on her own, often leading her into trouble. It’s a way to move the story forward while the Doctor is recovering from his regeneration, and shows that Sarah Jane is definitely a force to be reckoned with, someone who’s independent even when forced into the role of captive or scared woman. This is definitely true in the fourth episode, where Sarah Jane finds herself as the captive of the Robot, the one person who ever showed it true kindness. Sladen shows sympathy to the Robot even in its death, never blaming it for the actions of those who controlled it and begging UNIT and the Doctor to find another way and avoid hurting it. At the end of Jon Pertwee’s time on the show, a character was created to help ease the physical burden on him brought about by severe back pain. That character is Harry Sullivan, surgeon for the Royal Navy who’s been assigned to take care of the Doctor, played by Ian Marter. With Baker able to take on the physical challenges of the show, Sullivan’s time on the show was relegated to one season, but his easy going charm and rapport with Sarah Jane and the Doctor made his run memorable. Sullivan was never truly the dashing hero, being trapped in a supply cabinet by the Doctor at one point and captured by the SRS at another. Still, Marter’s old-school charm and willingness to pitch in wherever he can comes through in Sullivan’s actions, earning him a spot in the TARDIS. With such an overpowering on-screen figure as the Doctor, one of the challenges for the writers was to come up with interesting supporting characters for him to play off of. Robot marks the last regular series appearance for two long-time Who veterans, Brigadier Lethbridge-Stewart and Warrant Officer Benton. Long after his official departure from the show, the shadow Nicholas Courtney’s Brigadier could be felt in both the show AND in any other portrayal of the military commanding officer. For his last time out, viewers get the Brigadier’s calm and professional nature in full effect, never once allowing the bad guys to see him sweat. He’s a military man who does indeed shoot first, but also knows when the time comes to try something different, like one of the Doctor’s mad schemes. We never get the sense that the Brigadier misses the Third Doctor; he takes the new one in stride as long as he’s helping to keep Britain and the planet safe. Courtney was superb at “the stiff upper lip,” the perfect straight man to the Doctor, and was popular enough to appear a few more times in the series. Warrant Officer Benton, played by John Levane, is the enlisted counterpart to the Brigadier – loyal to his army, but also his friends and willing to break the rules when needed. His promotion to Warrant Officer feels like a nice send-off to the character, and the pure joy on his face when the Doctor tells him his plan to help take down the robot is “brilliant” is such a great moment. The characters created specifically for Robot are memorable enough. We get a female villain this time out, the sneering, domineering, Anne-Robinson-Forty-Years-Too-Early Hilda Winters as played by Patrica Maynard. Tight hair, pants suit, glasses…as both the scientific head of the Think Tank and the ruthless leader of the Scientific Reform Society, Winters channels every single fascist and jackboot cliché one can think of. On the opposite side is the creator of the K1 Robot, Professor Kettlewell, who is scatterbrained and looks like he just stuck his finger in a light socket. Edward Burnham plays him as stuttering, optimistic, and a bit clueless, worrying about the K1 Robot as his creation as Winters uses it to “do what’s best for humanity” in violation of the directives Kettleworth designed him for. Burnham does a fine job, though his defection to the SRS in the third episode seems to come out of left field a bit. Yes, that’s an Action Man tank being pushed and turned by an off-screen hand. And some of the primitive green screen with Sarah Jane (now in rag doll form for some shots!) being picked up by the Robot is laughable today. But the crux of the story, the actual Robot suit, is very well done for its time. The costume towers over the other actors, and the detail the creators put into the mask compensates for its reed-like wrists. Good actors can overcome sketchy special effects, and proof of this (aside from everyone else in Robot, cast and crew alike) shines through with Michael Kilgarriff’s performance as the K1 Robot. For the times when the suit looks like something out of a 7th grader’s garage, Kilgarriff manages to portray the Robot’s pathos and determination to do what’s best for humanity, no matter at what COST to humanity. There’s a little bit of arm flailing in the “Danger Will Robinson” mold, but Kilgarriff takes what room the suit gives him and puts on an emotional performance, especially in the fourth episode as he finds himself protecting Sarah Jane at all costs. His movements are a bit jerky, but for the most part viewers in the 1970’s can believe this Robot is getting around on its own and has the potential to be a major danger to humanity. Growing up, I was raised on “Doctor Who”. Monday through Friday, every night at 7pm, I’d make sure the TV was on channel 2 (PBS station WGBH out of Boston). They were showing the first seasons with Tom Baker (who looked an AWFUL lot like my Sunday School teacher, just saying). Which meant I was exposed to Sarah Jane Smith and Leela. I didn’t appreciate Sarah Jane back then, didn’t know she was an intelligent journalist who wouldn’t back down. No, I was a Leela girl — badass warrior woman who had no qualm about shanking every last enemy in the room, much to the Doctor’s chagrin. As a kid, I thought Sarah Jane was there just to be Harry’s girl. *sigh* I know better now. – They initially cut Pertwee regenerating into Baker at the beginning when they aired it on PBS. – I forgot about Kettlewell jumping ship, so, much like Cobi, that threw me for a loop when I rewatched it later as an adult. – Tom Baker, trying on post-regeneration outfits. – The Doctor, jumping rope and trapping Harry in the storage locker, is STILL an awesome bit. – So much RED when the Robot is involved! Still, as an opening story for Baker, it stuck with me. I felt for that poor, exploited Robot. Even if back then I wasn’t really aware yet about the Doctor being an alien who changed bodies like Spinal Tap goes through drummers. I just accepted it — and stuck around for the ride. Robot is a solid B+ of an episode. The Tom Baker era doesn’t truly begin until the next serial, The Ark in Space, as the show moves way from the action orientated Third Doctor era to one where Philip Hinchcliffe had kids diving behind the couch every week out of sheer fright. Tom Baker begins his seven year march to Logopolis by firmly telling the world that he has arrived. By overlooking the special effects and focusing on the secondary characters, viewers will find this story a fine introduction to the wide and wonderful world of the Fourth Doctor. – Robot’s “karate chop” to knock out the Doctor during the second episode cliffhanger. BRIGADIER: Well, naturally enough, the only country that could be trusted with such a role was Great Britain. DOCTOR: Well, naturally, I mean, the rest were all foreigners. Cobi’s Synopsis – If you’re looking to get into the classic series, Robot is a great place to start. The dodgy special effects are more than made up for by the presence of the K1 Robot, but this story is all about the introduction of Tom Baker as the Fourth Doctor. Tom Baker is the Doctor in…The Ark in Space. This entry was posted in Classic Doctor Who and tagged Brigadier, Doctor Who, Doctor Who Review, Elisabeth Sladen, Fourth Doctor, Harry Sullivan, Ian Marter, Nicholas Courtney, Robot, Sarah Jane Smith, TARDIS, Tom Baker. Bookmark the permalink. I had one of those Scorpion tanks at the time, I’d seen the Sinbad movie at the cinema – now feeling very old. For more Hilda Winters try the Sarah Jane Smith stories from Big Finish – full cast audio dramas mostly high quality and worth a listen. If the last episode doesn’t leave you gasping for more you’re a stronger Whovian than I. Thanks for taking me down memory lane.